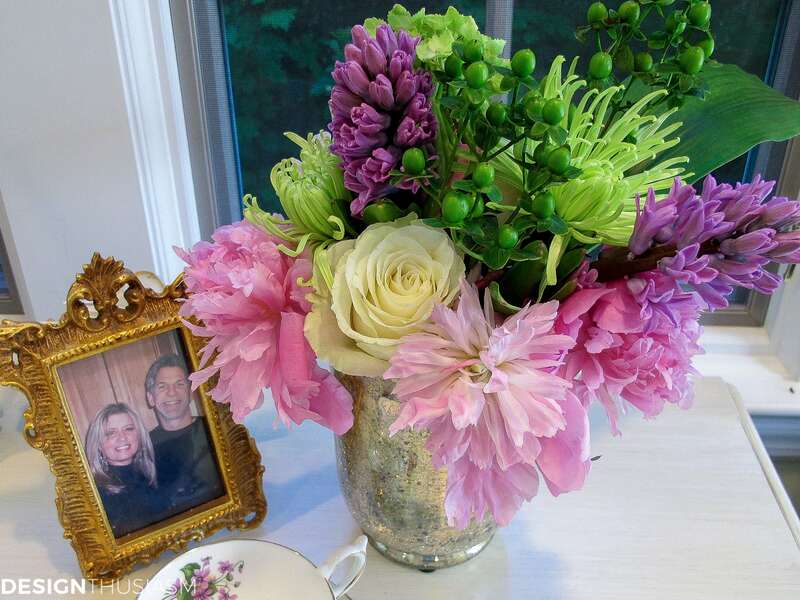 In this post: Ideas and inspiration for designing and creating your own DIY flower arrangements for a professionally styled party or event. Have you even been thrown into a creative endeavor in a sort of trial by fire? 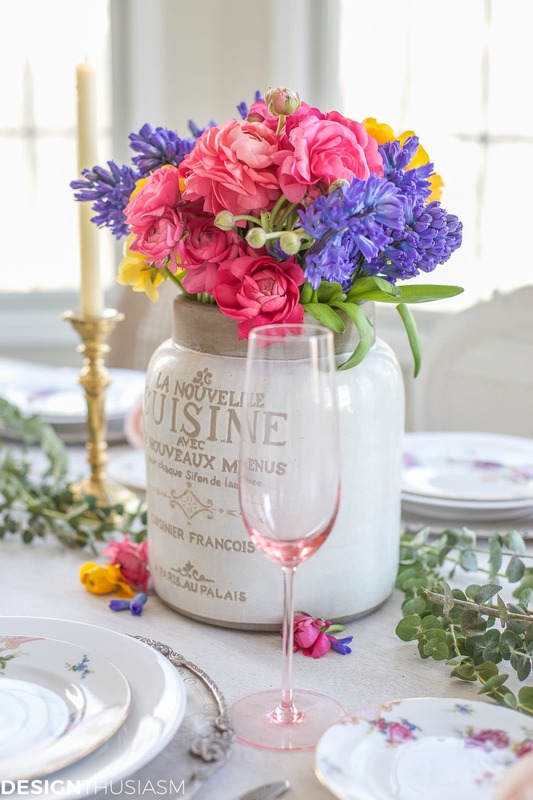 I’ve dabbled with arranging my own flowers for years, but recently, as I’ve concentrated more on my table settings, I’ve upgraded to using a woman who’s been in the business for years. I know her work schedule and would generally wander in the day before an event with photos of my fully set table, a cache of vases and a sense of what I was looking for. 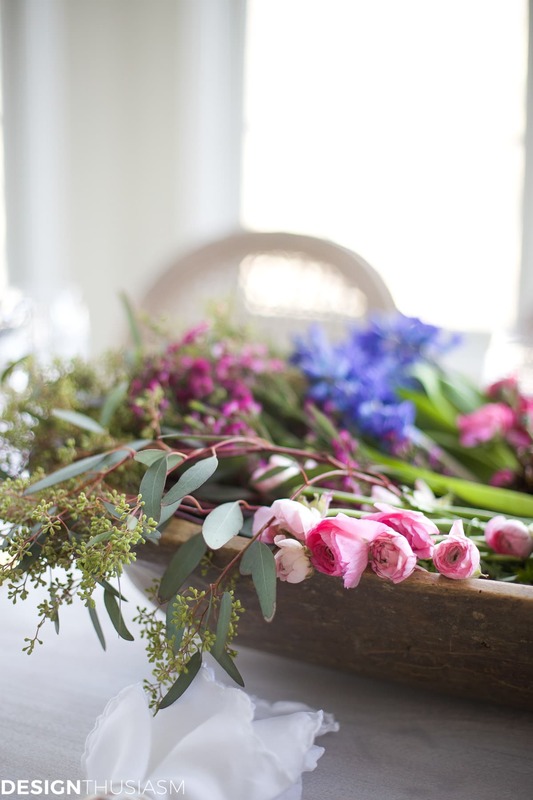 Then I’d pick some of my favorite flowers, driven mostly by color and texture, and she would work her magic. It wasn’t always that way and, at first, I’d stand over her micro-managing her work, a habit that was as unnecessary as it was no doubt annoying. But in time I came to trust that Marjorie was quite clear what I liked and quite talented at fulfilling my requests. So, imagine my surprise when I walked into the store to find that Marjorie was indeed not working on Saturday, the day before I was hosting a party. 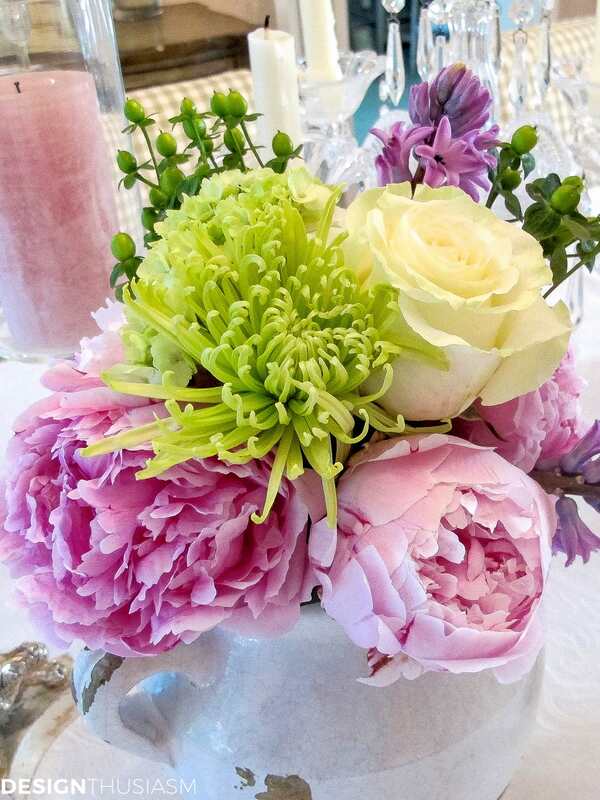 After the initial panic, a frustrating conversation with the floral assistants and a quick trip to another shop, seven vases in tow, I returned to her store, regrouped and realized the only person who was going to do my flowers that day the way I wanted them, was me. Floral design by default. Now, I’m about as neat at arranging flowers as I am at cooking, with cut stems shooting around the room and leaves and debris wafting to the floor, but I figured I had a full day to search the kitchen for the stray bits that shot from my scissors and flew into hidden corners, so I spread out my spoils and went to work. It always amazes me that no matter how much you think you overbought, you always realize you could have used a bit more. 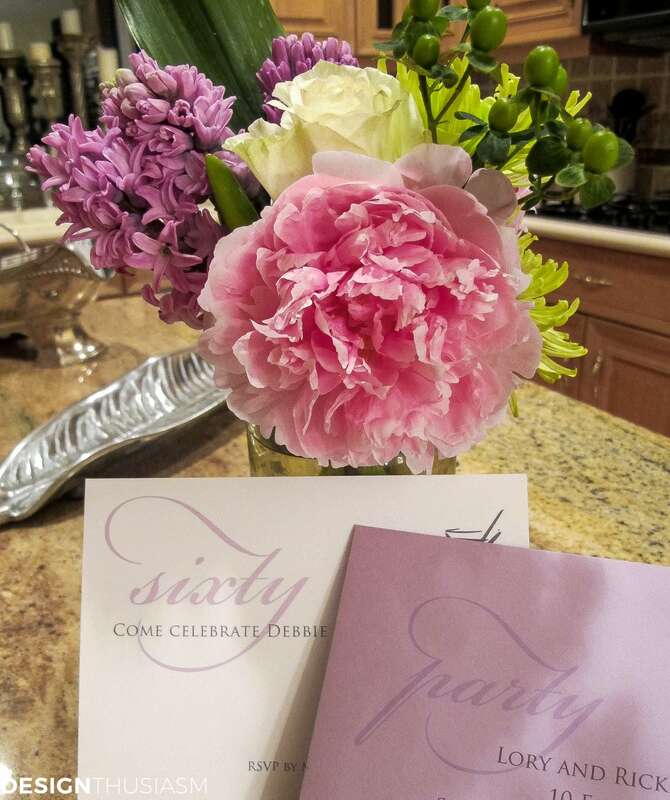 For this party’s DIY flower arrangements I selected peonies, roses, spider mums and hyacinths. 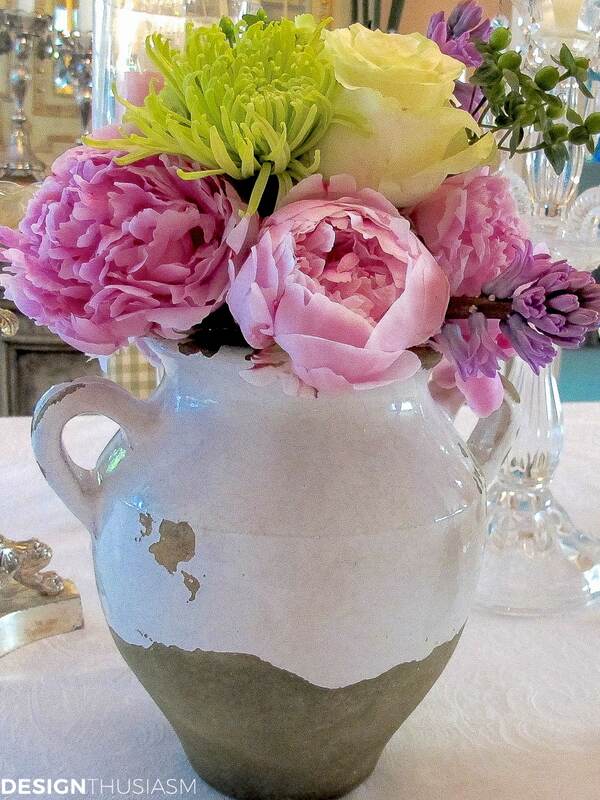 I started with a few glass containers and wrapped a bold leaf around the bottom of each of the vases. 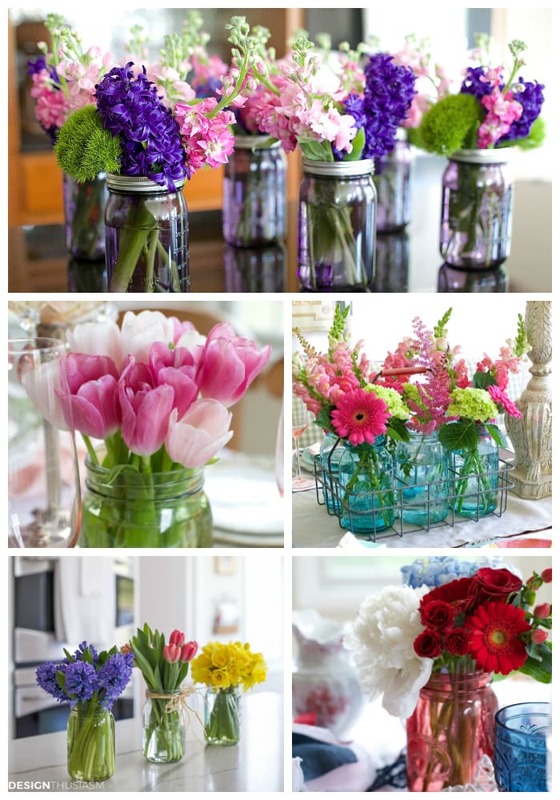 Next I gathered a colorful mix of stems in my hand, arranging and fluffing them as I went, before ever putting them in the containers. 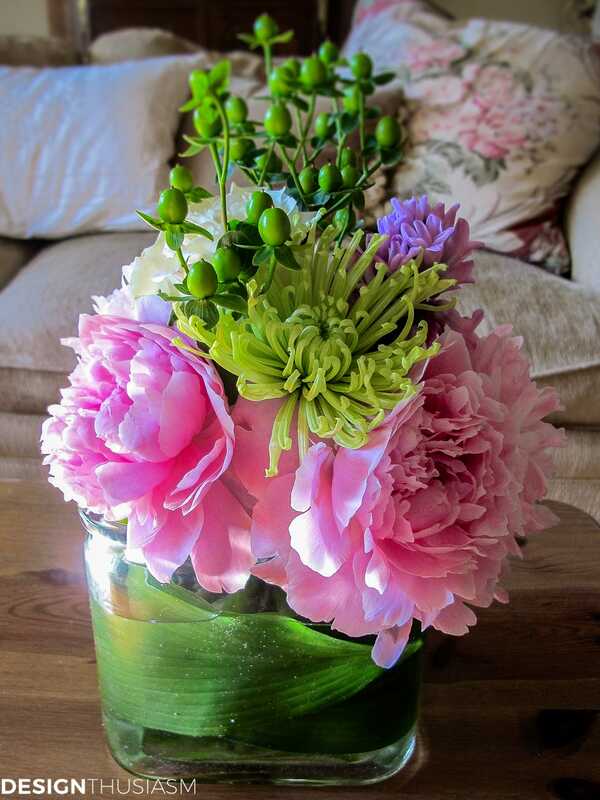 Once a particular gathering of flowers looked nicely balanced in my hand, I wrapped a rubber band around the stems high up near the blooms, to keep the cluster in place. 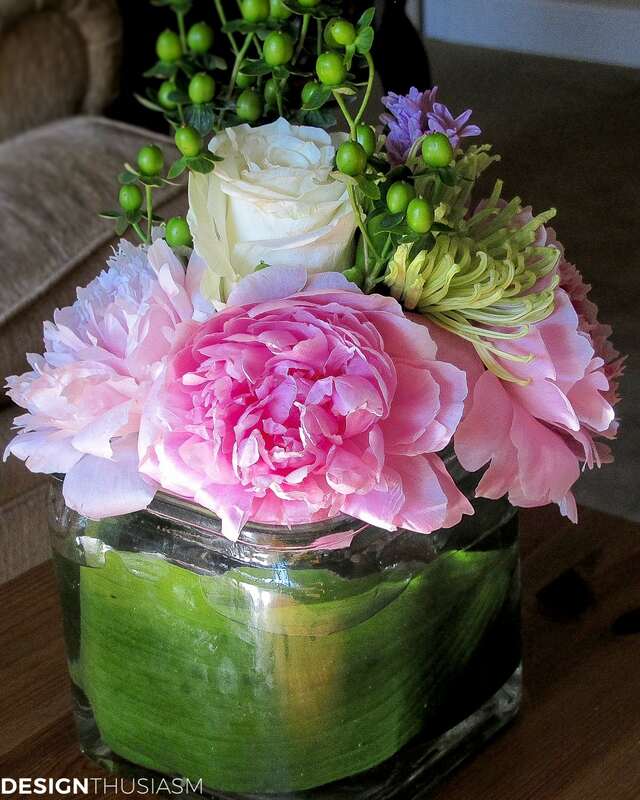 Finally I trimmed the stems so that the arrangements sat nicely in each vase. After years of watching Marjorie use this system, I’m now ready to take over and do it myself. And I never have to worry about her work schedule again! You did a beautiful job and it looks like you’ve been doing this for a while. The chandy is just too cute! Beautiful job! I can imagine the panic that set in when she wasn’t there! 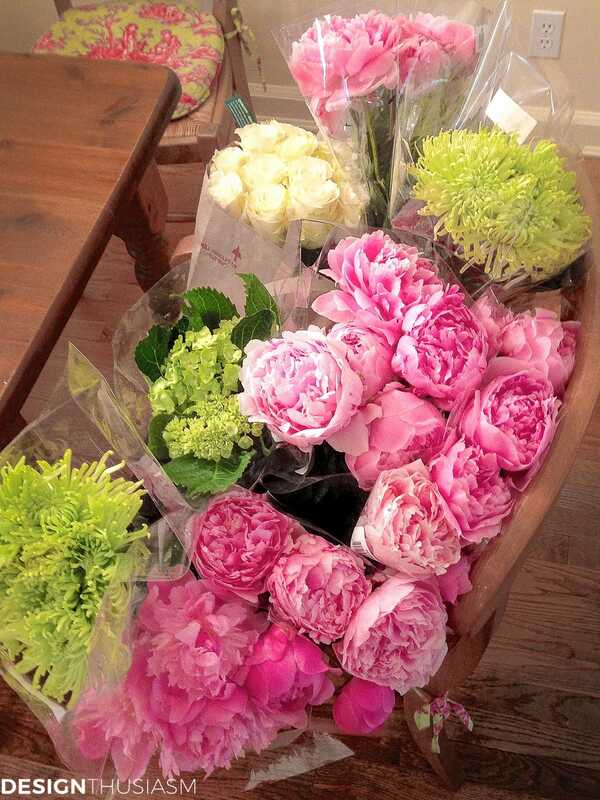 The flowers you bought were all gorgeous and perfect! Love the color combo and I have to believe the person you did this for was thrilled. 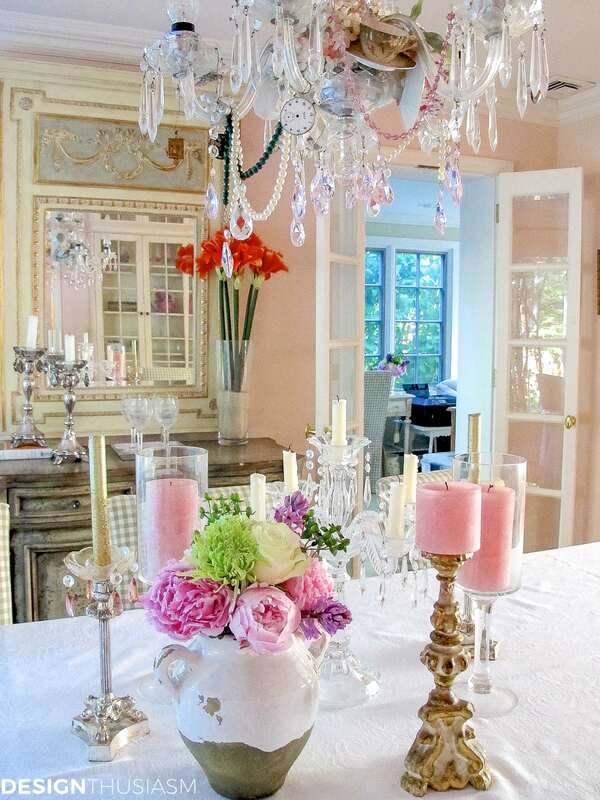 I like the way the chandelier is jazzed up- very pretty home too! 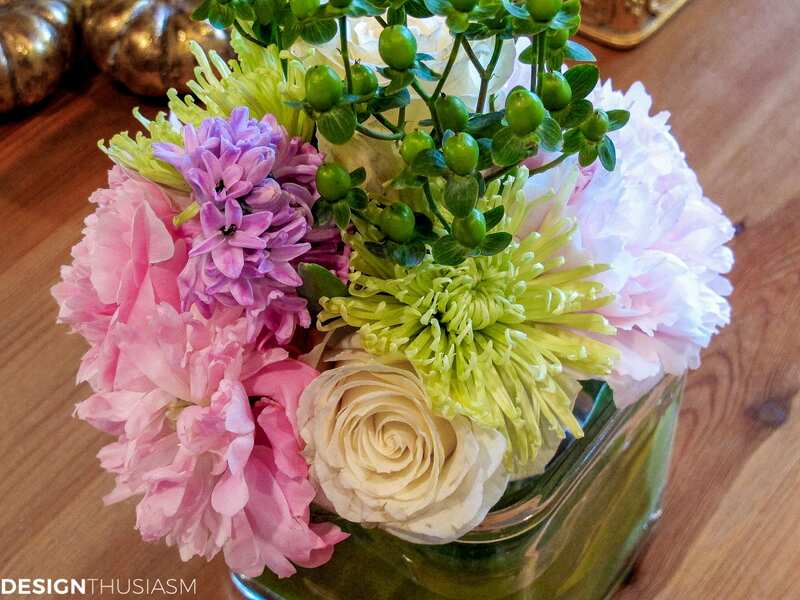 The first step in flower arranging is picking colors and textures that work well together. 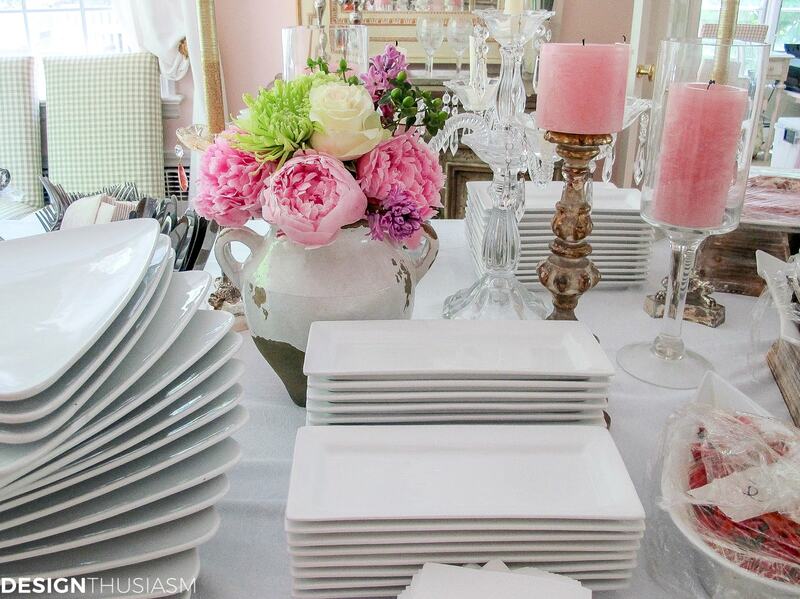 You’ve definitely got that down, and the bright colors play beautifully off the white dishes.